Built-In Atmosphere Gas Generators｜KYK - KANTO YAKIN KOGYO CO.,LTD. 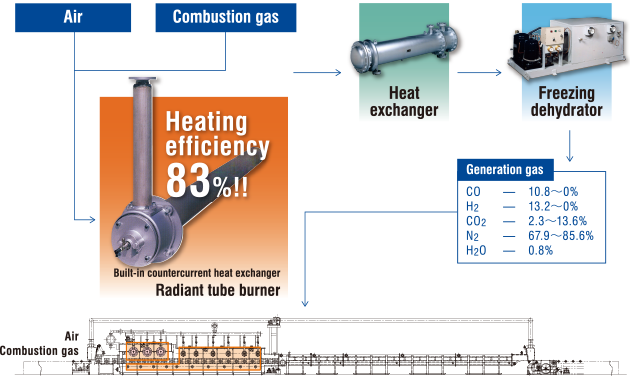 (for reuse of generation exhaust heat). 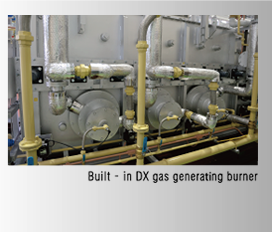 gas generation to achieve a high level of energy-savings. steels, and magnetic annealing of magnetic steel sheets. A regular stand-alone gas generator consumes a lot of cooling water to treat the heat produced during gas generation. effect of 35-50% and reduction of cooling water consumption up to 50% are available. KYK proceeds to the next stage towards higher level of environmental protection. 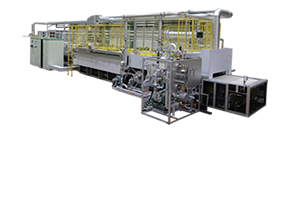 KYK started to manufacture and sell a continuous furnace with the built-in atmosphere gas generator in 1978 for the first time in the industry. Awarded an honor of excellent energy-saving continuous furnace by the Japanese association of mechanical industry in 1981. Awarded an honor of developing excellent energy-saving furnace by the Japanese government in 1985.
furnaces and established a very high reputation for its excellent energy-saving effects. available with KYK's unrivaled technical know-how.